Marilyn Nance was born in Brooklyn in 1953. She received her BFA in communications/graphic design from the Pratt Institute, an MFA in photography from the Maryland Institute College of Art, and completed the Interactive Telecommunications Program at the Tisch School of the Arts, New York University. She was a 1993–94 artist in residence at The Studio Museum in Harlem. Trained in film and photography, Nance creates works that investigate and celebrate African and African-American history and life. In November 2016, she presented work documenting the Festac ‘77 festival in Nigeria during a panel discussion at the “Black Portraiture[s] III: Reinventions: Strains of Histories and Cultures” conference in Johannesburg, South Africa. We visited Nance in her studio in October 2016 and invited her to visit the Studio Museum’s permanent collection to respond to three works we felt related to her practice, whether conceptually or formally: Sam Gilliam’s Tapestry 1 (1992–93), Sadie Barnette’s Untitled (2014) and Lorraine O’Grady’s Sisters ( from the Miscegenated Family Album) (1994). Primarily known for her photography of African-American and African diasporic life, Marilyn Nance is a visual storyteller who has been known to celebrate life and death as equal aspects of the human condition. Meditating on the quotidian and the spiritual, Nance connects space and time by juxtaposing and repeating photographic images, in turn often presenting seemingly disparate moments as diptychs and triptychs. The ability to combine linear storytelling with nonlinear visuals initially inspired Nance's embrace and use of the medium. Her black-and-white photographs observe and capture the nuances of humanity, both exploring how people relate to one another while highlighting the ability of the body to exist in multiple spaces and times at once. Recently, Nance has found herself returning to the work she made while at Festac ’77, where she was assigned the position of photographer for the North American Zone. 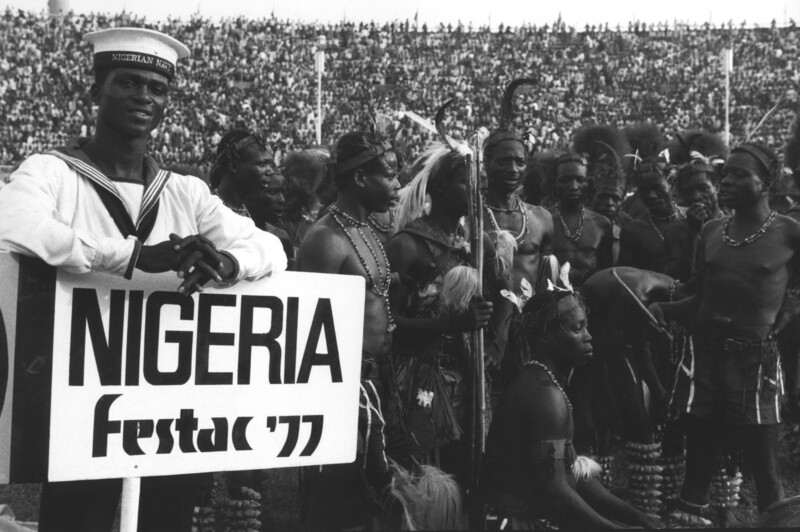 Also known as the second World Black and African Festival of Arts and Culture, Festac ’77 took place in Lagos, Nigeria and at the time was recognized as the largest cultural event held on the African continent. The month-long gathering of more than 17,000 attendees from 50 countries was promoted as the largest migration of African Americans from the United States to Africa—representing for many a symbolical reversal of the transatlantic slave trade.1 It was attended by more than 400 African-American artists, writers and performers. Using her documentation of this event as a departure point for new works that incorporate collage and quilt making, Nance notes that both practices have long played a major role in her immediate family’s narrative in New York and Alabama. We sat at a table in her studio, a space filled with photographs, fabrics and other ephemera, discussing her time in residence at the Studio Museum, as well as how her travels to New Orleans, Nigeria, Brazil and beyond have continued to influence her work as a photographer. Looking through several archival boxes containing the photographs she created during Festac ’77, Nance shares that her new collage series, created with artist Rafia Santana, would celebrate artists such as Valerie Maynard, Sun Ra and Ademola Olugebefola, who participated in the events during the festival and who are today represented in the Studio Museum’s permanent collection. In From the Studio: Artists in Residence 1993–94, Nance presented an installation entitled Egungun Work (1994), which recalls an Egungun festival she attended in 1981 while photographing the Oyotunji African Village in Sheldon, South Carolina. Stemming from the Yoruba cultural traditions of West Africa, the Egungun serve as the members of the community that have been gifted the responsibility of venerating and contacting the spirits of important ancestors on special occasions. From her expansive documentation of African spirituality in the United States, Nance constantly finds herself considering her ancestors. The photographs of gatherings in her installation are reconfigured to employ new signifying entities; the visual articulation of the Egungun’s message indicates remembrance, honor, celebration, release and mourning. Through her incorporation of banners, church fans and pews, she actively claims agency as the catalyst to the collective narrative. In her studio, we discussed how the presentation of her contact sheets and magnifying glasses, both elements of her installation, worked to invite viewers to interpret and edit her work. She recalls two elder women who came to see the exhibition and their discussion of the works they felt she should have printed for larger display. Her observation of this interaction sheds light on her interest in the construction of communal family albums, which empower the collective to unpack ancestral wisdoms while reimagining themselves in relation to the history of the black body in photographic imagery. 1. Babasehinde Augustine Ademuleya and Michael Olusegun Fajuyigbe, “Pan-Africanism and the Black Festivals of Arts and Culture: Today’s Realities and Expectations,” IOSR Journal Of Humanities And Social Science 20 (2015): 24. Nance's first trip out of the United States, to Lagos, Nigeria, at age 23 for Festac ’77, was infused with her own experience of working to understand family lineages and human connections. 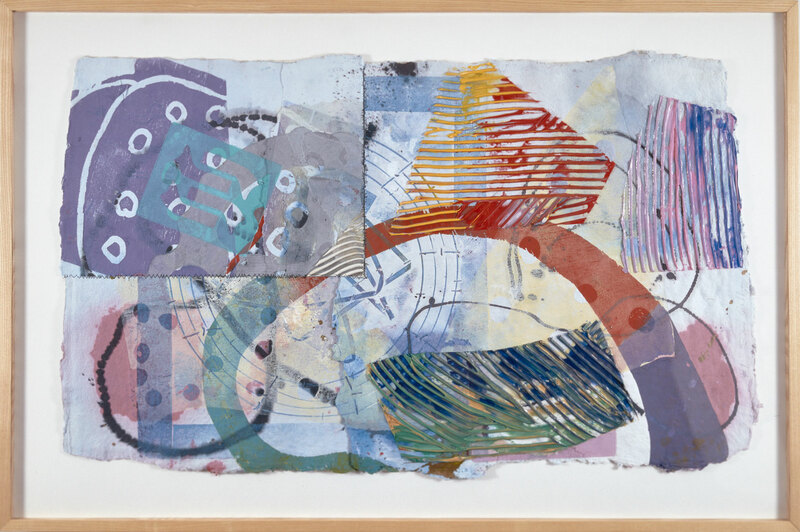 Abstract Expressionist painter Sam Gilliam is best known for his works on folded, creased and draped canvases that challenge the mediums of painting and sculpture. His experiments in transforming two-dimensional paintings into sculptural, geometric and architectural objects rose from a career-long interest in working beyond the frame and finding new ways to use painterly materials. Closely associated with the Color Field and Washington Color Schools, Gilliam prioritizes color in his compositions. As such, his works are emotive and energetic. Upon setting her eyes on Tapestry 1, Nance immediately felt the joy projected by the mix of textures and colors. “It’s delicious,” she states, referring to the thick, lush layers of red and orange that were screened onto the paper. Tapestry 1, as suggested by its title, is an assemblage of different materials and techniques, woven together by the hand of the artist. The layering of scribbles, stamped shapes and watery stenciled icons unite to create a cohesive composition—but each element is aesthetically and formally dense on its own. There is a patch of printed paper stitched into the larger composition, which recalls patchwork quilt making. For Nance, seeing Gilliam’s technique, of utilizing the textures and finishes of different materials in conjunction with represented images, challenged her to rethink the role of fabric. Family history, lineage and forging relationships are essential to Nance’s identity and crucial to her artistic practice. Her proclivity for storytelling emerges when she speaks of photographic and research projects. She speaks of her subjects and other artists as her family, and her deep appreciation for human connection and shared histories emphasizes this passion. Her interest in ancestry, legacy and history is shared by Sadie Barnette, a fellow alumna of the Studio Museum’s Artist-in-Residence program. Barnette, like Nance, investigates the intersections of personal and political relations. Barnette’s untitled graphite drawings meticulously demonstrate her interest in typography, as well as self-realization and identity formation through relationships. 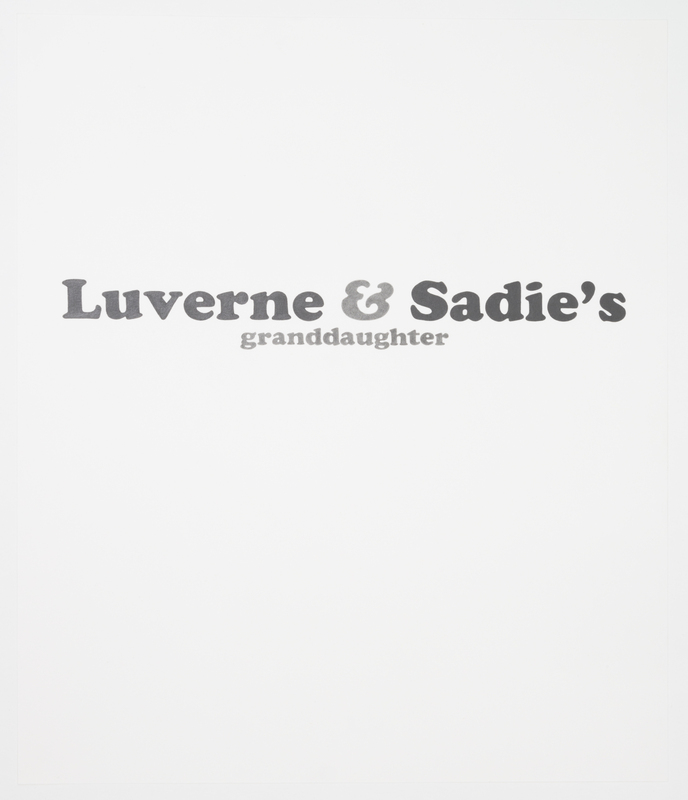 One work features the names of Barnette’s grandparents—“Luverne” and “Sadie”—and functions as a self-portrait. She distills these relationships to showcase the impact of one’s name and the multiple histories its legacy imparts. While at first startled by the subtle markings of Barnette, Nance deeply admires her precision in reproducing different typographies on paper, particularly in her detail and control. History, relationships and memories inevitably change as time passes, but Nance questions whether there is great privilege afforded to those who can preserve legacy and identity through text, rather than just intangible memories or images. With literacy comes power and authority, she suggests, and Barnette’s works preserve personal histories while maintaining an openness that allows for variety in audience engagement. 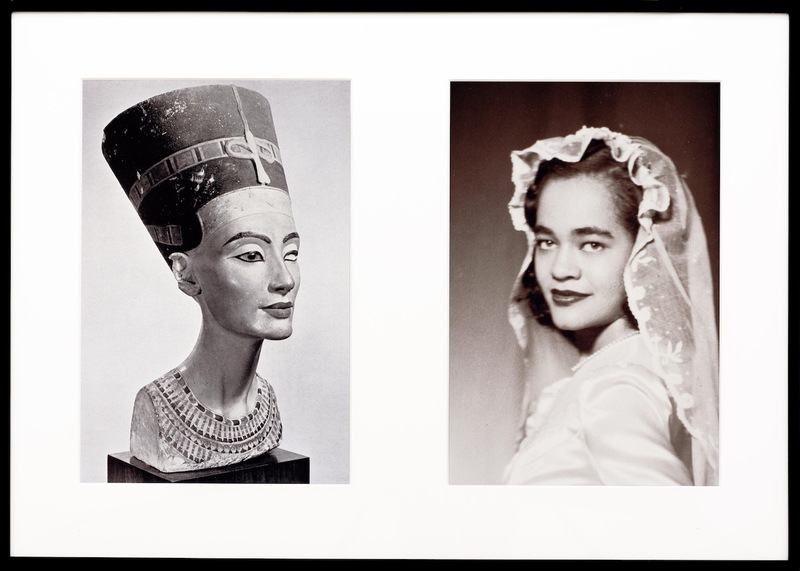 Extracted from her performance Nefertiti/Devonia Evangeline (1980), Lorraine O’Grady’s photographs Sisters (from the Miscegenated Family Album) subtly mourns and reconciles the estranged relationship that preceded the untimely death of the artist’s sister, Devonia. Throughout four sets of diptychs, O’Grady juxtaposes portraits of Devonia and her daughter with sculptural busts of Nefertiti and her family. Linking Devonia’s early death to the theorized disappearance of the Egyptian queen, the pairings hold immense metaphorical relevance, encapsulating both historical and personal narratives that imply the universal family condition is comprised of complex and segmented layers. In this work, individual loss becomes muddled with the artist’s gain of a larger global family through the visual resemblances that O’Grady noticed while visiting Egypt in her twenties, shortly after her sister’s passing. We admired the pairings while discussing the underlying notions of race, class and ethnology. Nance makes note of the consistent scale throughout the series, and observes how the diptychs actively eliminate concepts of hierarchy, further guiding her to concentrate on the reinforced links between the two ancestral narratives. Enthralled by the intergenerational connections between women of color and the ways in which information is passed on, especially through archives, Nance seemed to be pulled immediately toward the O’Grady series for its ability to situate antiquity with respect to one’s personal journey. Alluding to the narratives that congregate within the photographs, as well as the spaces between the frames, our conversation came full circle to O’Grady’s speculation that the vantage point from which the center and the margins align might best be viewed in their totality through the diaspora.